A device that promises a Minority Report-style computing experience has been unveiled by Swiss company dizmo. The user interface software promises to turn any digital display or surface into a futuristic gesture controlled interface. The company is hoping to raise funding for the project via Kickstarter. According to the company's founder Matthias Aebi, the Kickstarter campaign is the result of four years of research by his team. Aebi said that the traditional way of interacting with computers was a relic of past decades and had outlived its usefulness. “While hardware performance continues to grow, today's software feels inadequate in comparison,” said Aebi, who is also dizmo's chief executive and chief technology officer. According to dizmo, the technology enables users to interact with content in an “intuitive and immediate way”. It says that it is able to bring all of your wireless devices, sensors and controls together to bring you more control over your digital home. 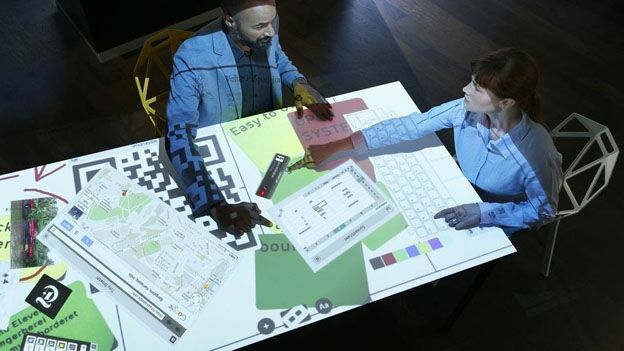 The device allows simulations, charts, images, live website and videos to “coexist and be moved, rotated and interacted with like physical objects on any digital surface”, according to the company. “dizmo is an idea tool for both consumers and developers, providing a multitasking and versatile environment that connects your digital life as part of the smart home and internet of things,” said Aebi. The device is compatible with Windows 7 and above, Mac OS X 10.7 and later and Linux. The company is also planning to release tools to connect the device to Arduino and Rasberry Pi. dizmo hopes it will be able to launch the product in June.